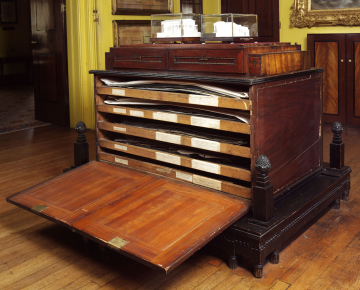 A rectangular plan chest with two single-panelled cupboard doors hinged at the bottom, the interior fitted with five drawers or 'sliders' (Dance's term) to store drawings. Across the doors is a painted inscription (white; repeated on the top of the cabinet): This cabinet enshrines a collection of Ar[chitect]ural Designs and Drawings by the late George Dance Esq. R.A. and another by his pupil the founder of the Soane Museum. The right-hand cupboard door has an inset brass ring handle which cuts through the inscription; the top of the cabinet is bordered by a triple reed moulding, painted black. The cabinet sits in a recess on a large rectangular plinth, also painted black, with sixteen reeded feet (the pair in the centre of each of the long sides are slightly raised and therefore suspended above the floor); the feet are formed as if they are columns with triple collars, almost like truncated Doric columns with reeding instead of fluting. A horizontal ball moulding is inset into the plinth. At the four corners of the base are short square columns surmounted by pine-cones. 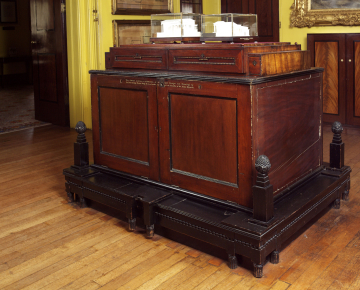 On top of the cabinet is a shallow cupboard, 16.5 cm high, with two doors, each hinged at the bottom, with inset panels bordered with bead and reel mouldings (what Soane called 'ball mouldings'); the mouldings are shaped top centre to accommodate diamond shaped keyhole escutcheons; these are not of the type used elsewhere on Soane's furniture but are squatter, the four sides being of equal length; between the two doors is a rounded upright. The cupboard forms a plinth on top of the cabinet; the front projects so that it 'floats' above the top of the cabinet (perhaps echoing the way the centre feet float above the floor); there is a ball finial at each of the top corners of this top cupboard. It is flanked by deep narrow mahogany drawers which may have contained drawing instruments; these have brass diamond shaped keyhole escutcheons of the type used on the Soane furniture. On top of the upper cupboard is a raised felt-covered platform. The base is veneered in mahogany on deal; the cabinet is deal with the sides grained in imitation of mahogany; the top is of deal which was perhaps formerly grained to resemble mahogany (over time the graining has been eroded by dusting); the plinth or cupboard on top of the cabinet is mahogany with mahogany veneer and the drawers are solid mahogany. This cabinet, along with certain other prized pieces, was not listed in the Furniture and Fittings inventory in 1837 but appeared in the inventory of Works of Art, where it was described as standing 'in the middle of the Dining Room'. The 'shrine' Poynder referred to was this cabinet or plan chest, in which Dance kept not just his own drawings but also those he had collected. It is 'simple and robust' and was presumably made by one of Dance's joiners on his instructions. 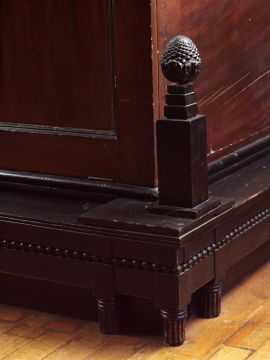 It has been assumed that Soane designed the elaborate black base with its pineapples symbolizing eternity at the corners and thus gave the cabinet its solemn and sepulchral appearance (it resembles a catafalque). However, Poynder's letter confirms that it was known as 'the shrine' within the Dance family before Soane acquired it and this seems to indicate that the base too was designed by Dance. Jill Lever has pointed out that without the current plinth the cabinet would have needed some kind of base with pull-out brackets to support the bottom-hinged cupboard doors - another indication that the base was present before Soane acquired the piece. The raised central platform may have been intended to display sculptures or models, or perhaps a bust of Dance himself. However, according to the Soane inventories nothing was displayed on top of the cabinet in 1837. Since Soane would have known the cabinet when it belonged to Dance this may reflect Dance's own intentions. The difference between the diamond-shaped keyhole escutcheons on the upper cupboard and those on the flanking drawers seems to indicate that the drawers were added by Soane. These small drawers are comparable to, but rather more elegant than, those on the Breakfast Room desk (see cats XF153 and XF154). The Dance Cabinet was a very late acquisition and must have been an awkward one for Soane as it was an extremely large piece of furniture for which there was no obvious position. He put it in the centre of his Dining Room - where the dining table (XF262) had previously stood - and hung it with drawings of his own works as a subtle tribute from the pupil to his 'revered master.' The cabinet remained in the Dining Room at the time of his death but soon afterwards was banished to the Monk's Parlour in the basement.6 Since that time it has had a peripatetic existence in the Museum and is currently in the North Drawing Room, where it has been since the 1920s. 1 SM Archive Ledger E, 18 November 1836. 2 SM Archive PC III/D/5/34. 3 J. Lever, Sir John Soane's Museum. Catalogue of the Drawings of George Dance the Younger (1741-1825) and of George Dance the Elder (1695-1768), London, 2003, p. 22. 5 SM 32/2C/2 a ground floor plan of c. 1837 probably drawn soon after Soane's death records the Dance Cabinet at the north end of the Library-Dining room and the large table pushed down to the other end. 6 1837 AA inventory records that the 'Cabinet was 'removed to the Monk's Parlour see also Trustees Minutes 7 November 1838'.